The Indigenous People of Biafra, IPOB, has warned against plans to assassinate its leader Nnamdi Kanu. If Nnamdi Kanu is killed, the Muhammadu Buhari government will not be able to contain the after effects, a statement by its Media and Publicity Secretary, Emma Powerful, said. 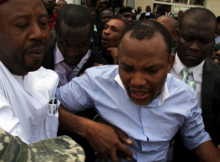 It pointed accusing fingers at certain governors, an elder statesman, a socio-cultural organisation, a security chief and a religious head, saying they are planning to kill Kanu. “..we promise them that any attack on Nnamdi Kanu or assassination attempt will radicalise the struggle for Biafran independence to the point which no one can contain”, Emma Powerful said.